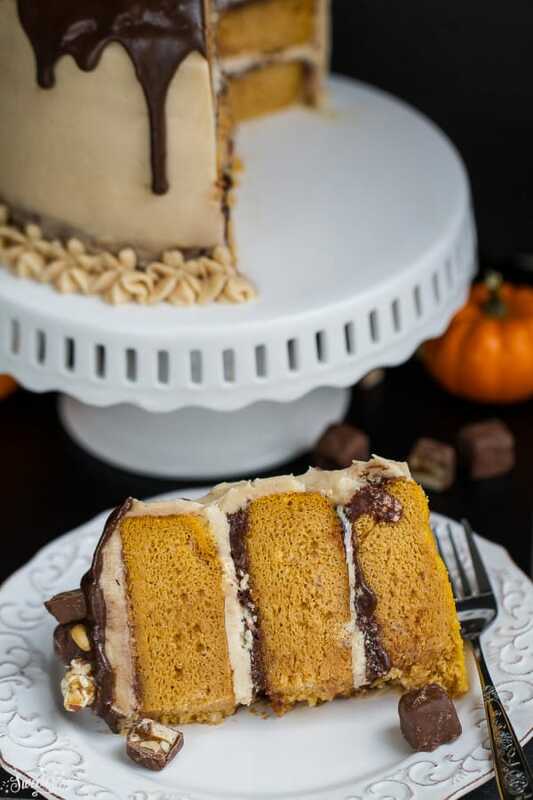 Pumpkin Snickers Layer Cake with Salted Caramel Frosting makes the perfect celebration cake. 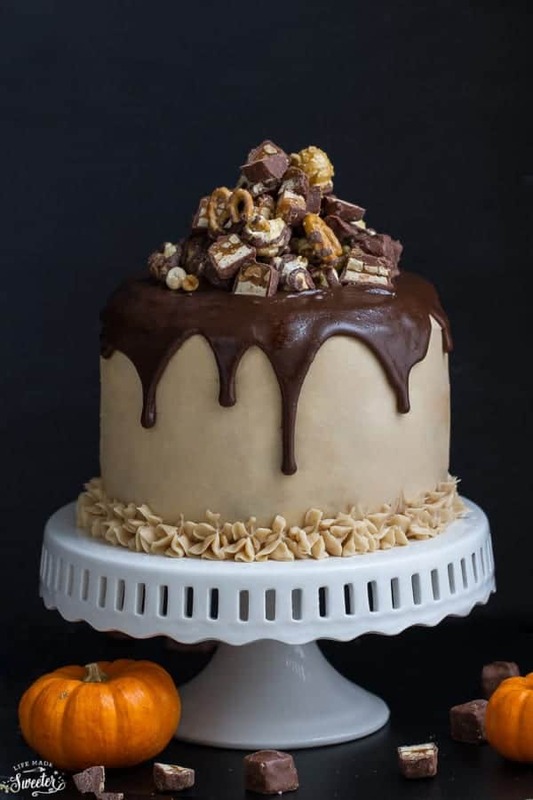 Best of all, it’s full of three layers of pumpkin cake with Snickers, salted caramel frosting topped with chocolate ganache, Snickers and caramel popcorn. When it comes to cakes, the ones I enjoy the most for myself are simple, fruity single layer cakes which don’t even require much or any frosting. 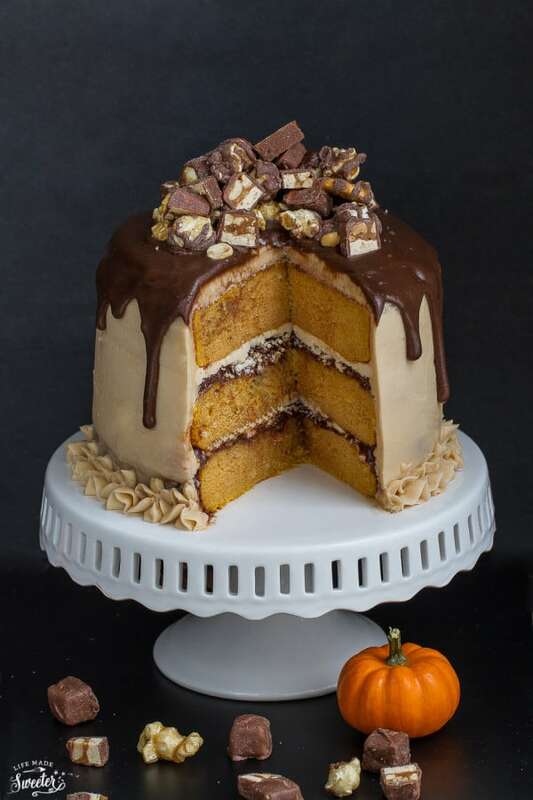 This Pumpkin Snickers Layer Cake is the total opposite but I’m so excited that I finally get to share it. It’s the hubs’s birthday today and since he is a total chocoholic and sweets lover, I knew that over the top and decadent was the way to go. I actually made this cake twice and used this one for photos while the other one is tucked away safely in the fridge for the hubs’ birthday celebration dinner later. Like most of the celebration cakes I make for our family, this one is made in 6 inch pans which gives you taller layers. It will also work in 8 inch pans but the layers won’t be as high. 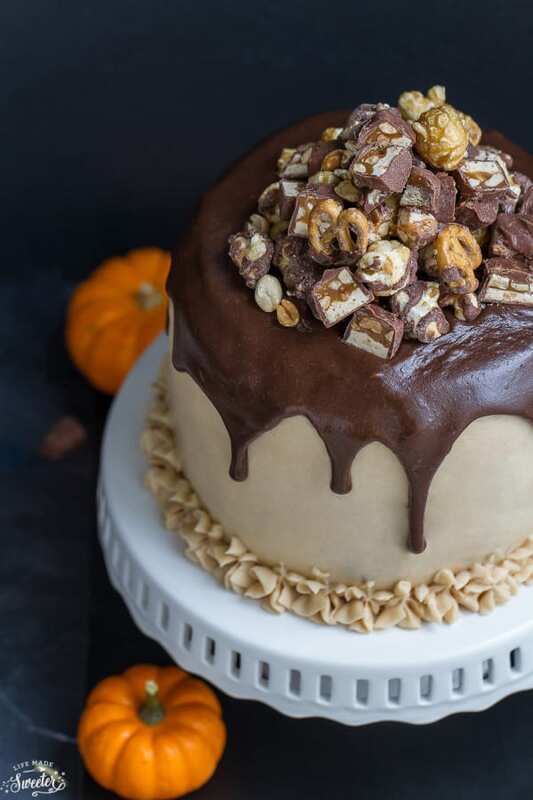 This Pumpkin Snickers Cake is rich, decadent and absolutely to-die for! The soft and moist layers are filled with pumpkin and warm spices in every bite. 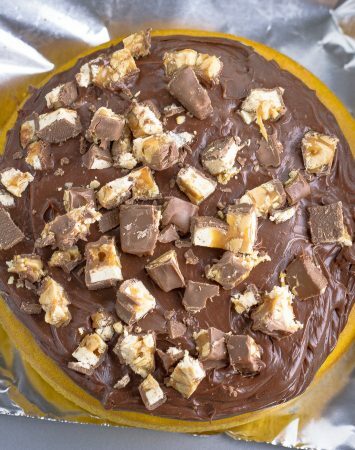 Each layer is topped with chopped Snickers and generous amounts of chocolate as well as salted caramel frosting which also covers the entire cake. A sea of rich chocolate ganache is poured on top and then we have some fun and toss in all of the hubs’ favorite snacks. Crunchy caramel popcorn, chopped Snickers and sweet and salty chocolate covered pretzels. 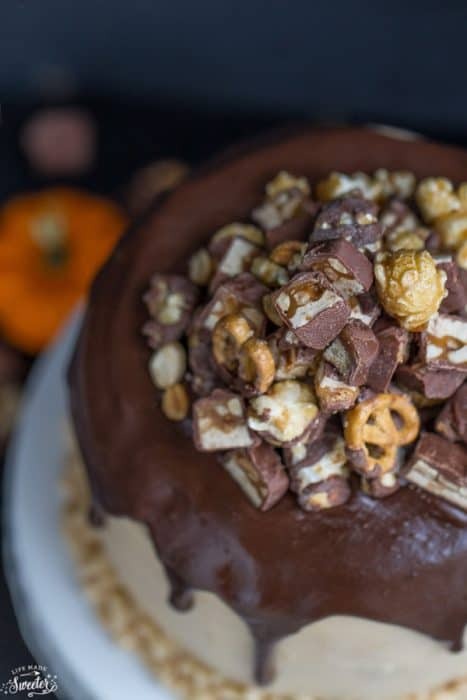 It’s a dream come true for any pumpkin, Snickers or salted caramel fan and would make a fun and impressive dessert for all of your fall or holiday gatherings! 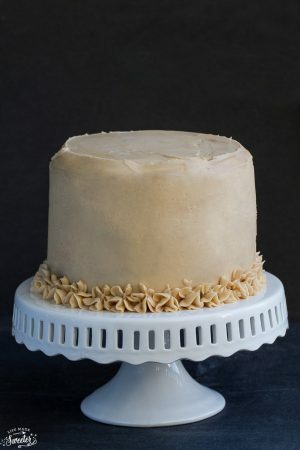 Make the cake: Lightly coat three 6-inch round cake pans with cooking spray and line bottoms with a round of parchment paper and set aside. In a large bowl, whisk together flour, baking soda, baking powder, cinnamon, pumpkin pie spice and salt. Set aside. In the bowl of a stand mixer on medium speed, cream together butter and sugar until light and fluffy - about 4 minutes. Beat in the eggs one at a time, scraping down after each addition. Add vanilla, pumpkin puree and oil and mix well to incorporate. Beat in half of the flour mixture then 1/2 of the milk mixing well after each addition. Stir in remaining flour and milk with a spatula. Do not overmix. Divide batter evenly into prepared pans. 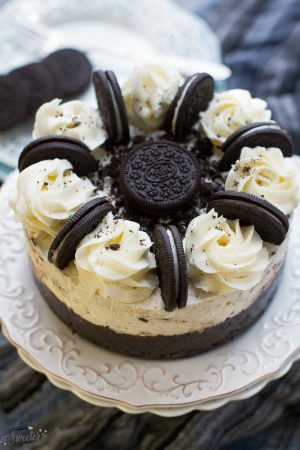 Bake for 22 - 27 minutes, or until a toothpick inserted into the center of the cake comes out clean. Remove pans from oven and allow to sit in the pan for at least 20 minutes. Flip and cool completely on wire rack before decorating. For the salted caramel frosting: In a large bowl, cream together butter and cream cheese until smooth - around 5 minutes. Beat in vanilla and caramel sauce until combined then turn the mixer to low and add powdered sugar until smooth. Turn the mixer back to high speed and add heavy cream as needed until desired consistency is reached. For the chocolate buttercream frosting: In a large bowl, cream butter until light and fluffy - around 3 minutes. Beat in vanilla then turn the mixer to low and add cocoa powder and powdered sugar and mix until combined. Turn the mixer back to high speed and add heavy cream as needed until desired consistency is reached. To make the chocolate ganache: place chocolate chips in a medium heat-safe bowl. In a small saucepan over low heat, heat the heavy cream until just before it boils. Pour hot cream over the chocolate chips and allow the mixture to sit for 1 minute. Use a spatula to stir the mixture until smooth. 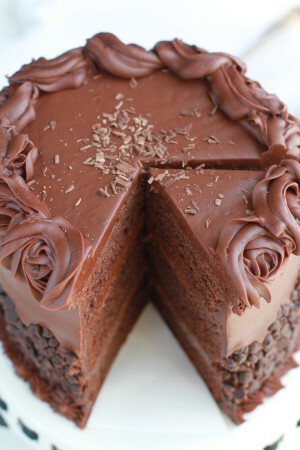 Allow the ganache to cool to room temperature before pouring it on the cake. Assemble the layers by placing the first layer on a plate or a cake stand. Spread a generous layer (around 1/4 - 1/3 cup) of chocolate frosting with an offset spatula. Sprinkle about 1 tablespoon of chopped Snickers over evenly. Take the second layer and and add 1/4 - 1/3 cup of salted caramel frosting. Sandwich cake layer frosting side down on top of the Snickers layer. Using your clean hands, gently press down on the top of the unfrosted top of the cake, to ensure cake is level and sticks together. Repeat by adding another 1/4 cup of chocolate frosting to the top of the unfrosted cake. Sprinkle on another tablespoon of Snickers over and take the final layer and add 1/4 cup salted caramel frosting and place on top of the Snickers. Push down one last time and adjust to make sure cake is level and straight. Apply a thin crumb coat of salted caramel frosting on the top and sides of the cake. Place in the freezer to harden the crumb coat for about 10 minutes. Apply a thick and even layer of frosting and spread smoothly using an offset spatula or cake smoother. Top with chocolate ganache, Snickers, caramel corn and chocolate covered pretzels. Decorated cake is best enjoyed the same day or wrap and freeze unfrosted cake layers.